Below are the thoughts I shared at the Promotional Assembly for our Grade 7 students (now Grade 8s!) on June 24. The Promotional Assembly is a special tradition at BICS and many other elementary schools. I am always conscious when I am immersed in one place so deeply – in my case BICS on Bowen Island – of not assuming things are different, special, or even better here than elsewhere but I would cautiously say that graduating from BICS is a more significant moment than for students graduating from other elementary schools. Next year, each day you will travel off island. You will have longer days and far more independence than any of your peers in Secondary School. You will need more trust and more independence from your parents than many of your peers will need. I have no doubt that academically and socially you are. You have your parents’ guidance and BICS is an outstanding school that has provided you with wonderful learning opportunities. But are you ready for the decisions secondary school offers you? I’m not referring to those Health and Career Education lessons we have spoken of so often – the times when saying no to something dangerous or unhealthy is quite obviously the right answer. Those are incredibly simple decisions though often placed in complex situations. The complex decisions I am talking about in this next phase in your life is how you will prioritize your time; how you will manage the challenge of opportunities. These next years will be filled with an abundance of opportunities – literally everywhere you look there will be opportunities: band over here, rugby over there, choir down that hall, mechanics down another, improv in the theater, ski club, the list will go on. And you will have time, perhaps more time than other points in your life, to take advantage of those opportunities. As you get older, opportunities and time do not disappear, but you do have to look harder for them. They are often not just down the hall. So have your parents and the school prepared you how to prioritize your time? We have no doubt shared that you need to spend time reading and doing your best with your schoolwork; and you do(!) but have we told you to not join basketball so that you will have time for band and choir? Or not to join improv in order to have time for the environmental club? Your interests are changing and always will change. And to be honest, most of the people who might give you advice on what to participate in are wrestling with some questions ourselves: is it best to excel at Field Hockey at the cost of not doing much with music? Or is it better to spread your time across many activities and never really excel at any? Should you do as many activities as you can while a teenager –play instruments, join choir, play soccer – and then specialize in something at a later age? Or is that too late to excel at a sport or activity? These are complex questions without any easy answers. So I have no advice to share with you on what to participate in. I only have two questions I want you to ask yourselves as you enter this next phase in your life and throughout your life because prioritizing time is one of the most important things you will do. Question 1: Why do you do what you do? It seems like the answer to this question would be obvious – “it’s fun” is a common response. But we often pursue our interests without thinking about why – only that we find them enjoyable for some reason. Is it because we’re good at it and it makes us feel better about ourselves that we are good at things? Do we like competition? Winning, or at least the pursuit of winning? Do we like spending time with the people who do the activity with us? Does it allow us to travel? Can you get a scholarship with it? Can you get paid to do it professionally? Does it help other people? There seem to be a lot of right answers as to why we do what we do; the only thing I’ve noticed is that most of the things in my life I truly enjoy are things I improve at. There is something inherently satisfying about improving; it is the thing that keeps us progressing not regressing, the only thing I know that combats aging. Why do you do what you do? Ask this question to prioritize your time. Will you dedicate your hours to one sport or activity so much that you have to turn down opportunities to do others. Is your dedicated activity important enough to you to sacrifice others – does it build your confidence, build your peer network, allow you to travel, satisfy your competitive streak – enough to decline other opportunities? Or will you not specialize – will you instead “generalize”. Will you do a number of activities but never spend enough time on any of them to truly reach your potential? There is no right way of prioritizing time; there is no right answer to why we do what we do. But there is a wrong answer. The response, “Because there is nothing else to do,” is the wrong answer. No one should respond in this way, and definitely not people living on Bowen Island, coming from the families you do, and going to the schools you go to. Your challenge is one of opportunity. Your conditions to succeed are ideal. So specialize or generalize – it will be different for you all. But say yes; seek out opportunities and do meaningful things, things where you can answer the question of why you are doing it. Question 2: Why do you not do the things you want to do? If the activity is safe and healthy, unlike question 1, there are very few right answers here. For the most part, we don’t do the things we think we will enjoy because we don’t think we can do them. We doubt our abilities, we question whether we can contribute, we wonder if we will be successful and what others will think of us if we are not. We think there are some things we are good at and others we are not and never will be. When we say “no” to doing things we truly want to do, it is not that we underestimate our abilities – usually we are bang on in assessing our abilities. What we do is underestimate our potential. 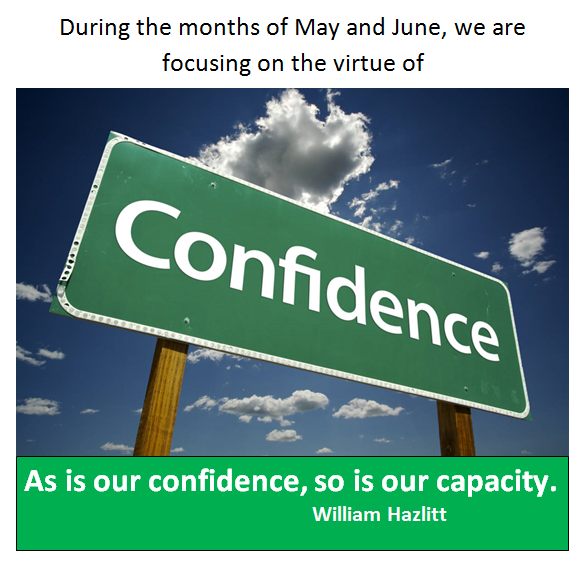 Our featured virtue this month is confidence. And in promoting this virtue, I don’t encourage you to have confidence in your basketball abilities if you have never played basketball. I do encourage you, though, to have confidence in your potential. Have confidence that if you commit to working incredibly hard, you can do incredibly well. In addition to teaching you skills and providing experiences that help you understand the world, BICS taught you to be a learner – our school has been deliberate in increasing your capacity as a learner. What that means is that not only do you leave BICS with your current skillset and current knowledge and understanding, but you also leave with a huge capacity to learn and do more. Teachers are proud of the progress you have made but most proud of the progress you can make. Grade 7s, as you look around this gym, please notice your teachers of this year and years past. Notice families and community members. They’re here because they care about you and they have or had a role in helping you be the person you are, the person that is ready for secondary school and a wonderful life beyond that, a person of immense potential. Match our confidence in you. Match our belief that Rockridge Secondary is incredibly lucky to have you as students next year. You will make that school even better than it is. But also know that confidence is different than arrogance. Confidence is believing in yourself – not just your abilities but your potential. Confidence is helpful; it pushes us to do things that stretch us into more capable and successful people. Arrogance is the belief that you are better than others. Arrogance is not helpful; it just annoys the people around you and makes them less likely to help you succeed. So as you go forward, go forward with confidence. You are well set-up for success, not simply of where your abilities are now, but because of the potential of your abilities. Prioritize your time to take advantage of the remarkable opportunities that are afforded to you. We are incredibly privileged as Canadians that one of our challenges in life is a challenge of opportunity – there are so many possibilities, we have the privilege of prioritizing our time. That means the question must be asked and must be asked often: Why do you do what you do? You are a wonderful group of students. We will miss you greatly at BICS but this sentiment is eclipsed by excitement for all that is ahead.